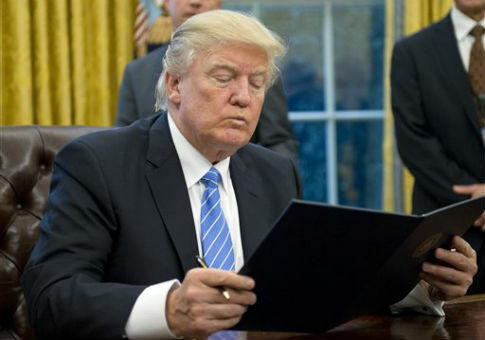 President Donald Trump signed a new executive order Monday that restricts immigration from six Muslim-majority countries for 90 days, dropping Iraq from January's original version of the order, and suspends the United States refugee program for 120 days. The executive order revised Trump's controversial travel ban implemented six weeks earlier that has faced a wave of legal challenges in federal courts. The new measures will take effect on March 16. Iraq was removed from the ban following repeated conversations between Trump administration officials and representatives of the Iraqi government. President Trump and Vice President Mike Pence both discussed the issue with Prime Minister Haider al-Abadi last month. Following discussions with Secretary of State Rex Tillerson, the Iraqi government agreed to share information on its vetting process and citizens with the United States. "Iraq is no longer one of those countries because we have received firm commitments from the government of Iraq over the last several weeks since the first executive order was issued about increased cooperation with the United States in terms of information sharing," a Homeland Security official told Business Insider. "We have received adequate assurance from the government of Iraq that we will be able to do the kind of vetting and screening of its nationals that the president of the United States has directed." The six countries under the ban are Syria, Iran, Libya, Somalia, Sudan, and Yemen. The new order states that citizens from these six countries who are legal U.S. permanent residents or have valid visas to enter the U.S. are not subject to the ban. The original version did not clearly distinguish between people with existing visas and those trying to get new ones. Monday's order only prohibits the issuance of new visas. "If you have a current valid visa to travel, we welcome you," Secretary of Homeland Security John Kelly said, appearing with Tillerson and Attorney General Jeff Sessions in Washington, D.C. on Monday. "Unregulated, un-vetted travel is not a universal privilege, especially when national security is at stake." The new order, which says the U.S. will not accept more than 50,000 refugees in a year (down from the 110,000 ceiling set by the Obama administration), also scrapped a provision that gave preferential treatment to religious minorities. Despite these and other changes to the travel ban, Democratic lawmakers were quick to label the order "discriminatory" and "un-American." "Despite the administration's changes, this dangerous executive order makes us less safe, not more, it is mean-spirited, and un-American. It must be repealed," Senate Minority Leader Chuck Schumer (D., N.Y.) said Monday. "I fully expect this executive order to have the same uphill climb in the courts that the previous version had." He added that while the new order is "watered down," it is still a "ban." Rep. Emanuel Cleaver (D., Mo.) called Trump's revised order "discriminatory and still wrong" via Twitter. The President’s second attempt at a #travelban is still unconstitutional, still discriminatory and still wrong. Rep. Ruben Kihuen (D., Nev.) also weighed in on the issue, reportedly calling the order "Nationalist." Republicans, meanwhile, were quick to defend the new measure. House Speaker Paul Ryan (R., Wis.) said the ban "advances our shared goal of protecting the homeland." Rep. Michael McCaul (Texas), chairman of the House Homeland Security Committee, said in a statement that he looks forward to working with the Trump administration to protect the United States from terrorists abroad. "I have long supported taking bold steps to keep terrorists from entering America. I look forward to reading the details of the president's new executive order and conducting oversight to ensure it is implemented smoothly," McCaul said. "This month I am also launching a bipartisan Congressional task force focused on closing security gaps that might be exploited by jihadists to sneak into our country, and I hope the administration will work closely with us to put in place new security checks to protect our people from the threat of terror." Tillerson said on Monday the ban will "bolster the security of the United States." The Iraqi government praised the new order as well. "[The] Iraqi Foreign Ministry expresses deep relief regarding the executive order that was issued by the American president Donald Trump, which excludes the Iraqis from the travel ban to the United States," Iraqi Foreign Ministry spokesperson Ahmad Jamal said, according to CNN. "This is considered an important step in the right direction that strengthens and reinforces the strategic alliance between Baghdad and Washington in many fields, in particular the fight against terrorism." This entry was posted in National Security and tagged Chuck Schumer, Donald Trump, Immigration, Iraq, MIchael McCaul, Paul Ryan, Rex Tillerson, Trump Administration. Bookmark the permalink.